Google Lat Long: Google Earth... in your browser... on your Mac! Google Earth... in your browser... on your Mac! A long time ago, at a conference not too far away, Google launched the Google Earth Browser Plugin, with the Google Earth API. At the time, we promised that we would bring it to the Mac, and now we have. 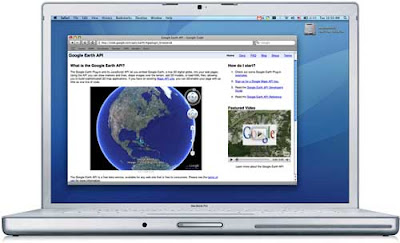 Today, we're excited to announce the release of the Google Earth Browser Plugin for Mac OS X 10.4+ (PowerPC and Intel). The Mac plugin is supported on Safari 3.1+ and Firefox 3.0+. The download link should now be available to all users from any Earth API-powered site. We also released a game, Puzzler, in honor of the new Mac plugin. It is, of course, playable on a PC as well. We think you'll like it. And as usual, it's open source, so you're free to adopt the code. In addition to the Mac release, we've also upgraded the Windows version of the plugin. See the release notes for more details.